The head of Serbia's nationalist Radical Party, Tomislav Nikolic, has resigned following a dispute over the party’s stance on Kosovan independence and Serbia's EU future. Nicolic announced on Thursday that the party would vote for the Stabilisation and Association Agreement, a critical step towards EU membership. The party had previously held that they were opposed to any moves towards co-operation with the European Union unless the bloc recognised Serbia as including Kosovo. Twenty-one out of twenty-seven EU members have recognised Kosovo’s independence. His opponents in the Radical Party, led by its formal president Vojslav Seselj who is on trial before the UN war crimes tribunal, are against joining the organisation. 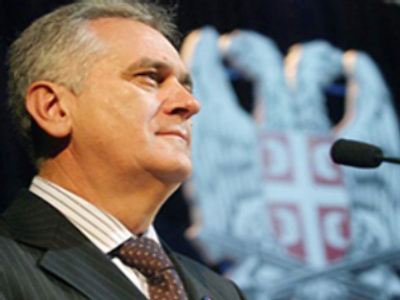 Nikolic, who lost two presidential races to pro-European candidate Boris Tadic, served as acting leader of the Serbian Radical Party while its president was facing war crimes charges in The Hague. Media reports suggest that Seselj pressured party members to oppose Nikolic's decision to ratify the key EU document. The party now faces a split between supporters of the imprisoned Seselj and Nikolic who represents a softer approach towards the European Union. Though the Radical Party controls the largest number of seats in the Serbian parliament, the government is led by a coalition which intends to ratify the EU agreement despite the nationalists' protests.